Mass spectrometry imaging (MSI) was first derived from techniques used in physics, which were then incorporated into chemistry followed by application in biology. Developed over 50 years ago, and with different principles to detect and map compounds on a sample surface, MSI supports modern biology questions by detecting biological compounds within tissue sections. MALDI (matrix-assisted laser desorption/ionization) imaging trend analysis in this field shows an important increase in the number of publications since 2005, especially with the development of the MALDI imaging technique and its applications in biomarker discovery and drug distribution. 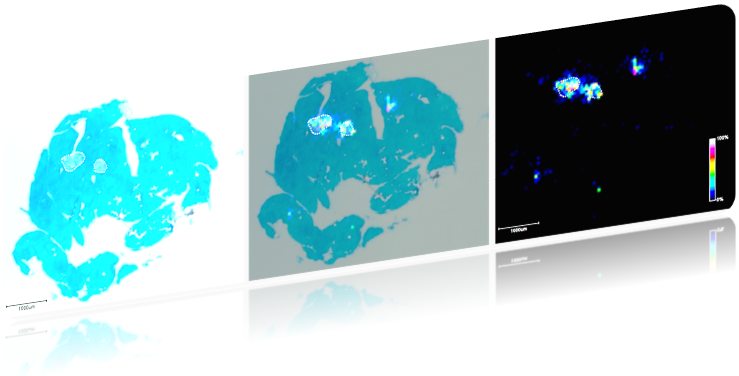 With recent improvements of statistical tools, absolute and relative quantification protocols, as well as quality and reproducibility evaluations, MALDI imaging has become one of the most reliable MSI techniques to support drug discovery and development phases. MSI allows to potentially address important questions in drug development such as “What is the localization of the drug and its metabolites in the tissues?”, “What is the pharmacological effect of the drug in this particular region of interest?”, or “Is the drug and its metabolites related to an atypical finding?” However, prior to addressing these questions using MSI techniques, expertise needs to be developed to become proficient at histological procedures (tissue preparation with frozen of fixed tissues), analytical chemistry, matrix application, instrumentation, informatics, and mathematics for data analysis and interpretation.